Jodie Archer spent her childhood hiding in the changing rooms of the clothing stores her mother managed: she would pile sweaters all over the floor to look as though she were putting together an outfit, and would sit for the 8 hours the shops were open and read books in any genre she was allowed. At this age, she decided the only sensible profession in the world was to be a writer, but sensible people told her that it was not sensible at all to pursue such an unlikely dream. In pursuit of plan B, she was, for a while, a (not very good) young actress. She would take the parts of the characters and even writers she was most interested in--Alice in Wonderland, Matilda, Charlotte Bronte (which is when she most spectacularly forgot her lines), and once even Winnie The Pooh (which was fatal for her street cred at school). When she was given parts that involved singing on stage, she really proved that she was not meant to be involved in this business at all. A compulsive writer of letters, stories, scripts and even a newsletter for the neighborhood cats, she never thought again of becoming a writer for real until her school displayed a blurb she wrote for a book she had never, in fact, written, and she was besieged by requests for the text. Still, she was told it would be more sensible to become a lawyer than an author, and she must study English (if she insisted) an then convert to law. Before she went to Cambridge to study English, Jodie took a year out and wrote for several local newspapers and magazines, and then worked as a runner and researcher in TV. Throughout her following years at St, John's in Cambridge, (where the law was forgotten after her first lecture), she wrote reviews and features for various news outlets, and edited the May Anthologies and other well known university magazines. Once she graduated, she was offered training schemes at Macmillan and Penguin, and spent two years learning the publishing industry before becoming an acquisitions editor at Penguin. While this was exceptionally useful training, it showed her just how hard it is to make it as an author, and she thought it best to play it safe. 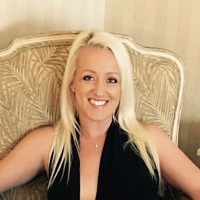 Jodie left the UK for a scholarship at Stanford University in California, where she spent time teaching nonfiction and memoir writing alongside her research in contemporary fiction and bestsellers. While at Stanford, she enjoyed the blue skies and palm trees of California and wrote most of her first (unpublished) book. She got her first interest from agents the day her mother suddenly died. Just after that, her marriage broke down, and she abandoned writing for a couple of years. After she got her PhD, Jodie was recruited to Apple, where she became the lead in research on books. After she was approached by her agent to write a book based on her doctoral research with Matt Jockers, she wrote a pitch. 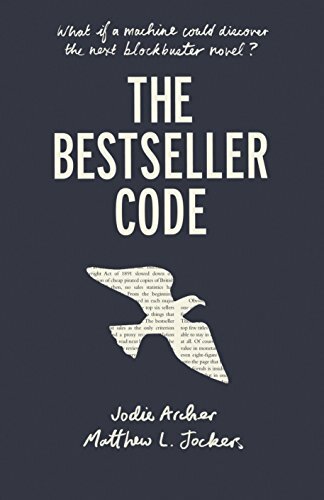 She left the corporate world to write The Bestseller Code after its acquisition became deal of the week in New York. Finally, at 35, Jodie is a full time writer. She lives in Colorado with her second husband, Bodi, their three cats, and the bullfrogs, snakes, pelicans and coyotes that like to share their land. Ask most people about massive success in the world of fiction, and you'll typically hear that it's a game of hazy crystals balls. The sales figures of E. L. James or Dan Brown seem to be freakishâ€”random occurrences in an unknowable market. So often we hear that nothing but hype explains their success. But what if there were an algorithm that could reveal a secret DNA of bestsellers, regardless of their genre? What if it knew, just from analyzing the words alone, not just why genre writers like John Grisham and Danielle Steel belong on the lists, but also that authors such as Junot Diaz, Jodi Picoult and Donna Tartt had tell-tale signs of success all over their pages? Thanks to Jodie Archer and Matthew Jockers, the algorithm exists, the code has been cracked, and the results bring fresh new insights into how fiction works and why we read. 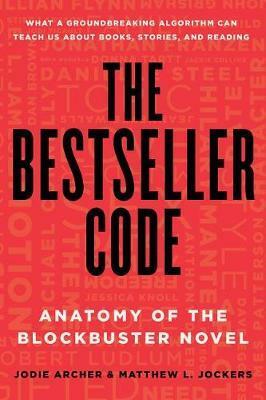 The Bestseller Code offers a new theory for why Fifty Shades sold so well. It sheds light on the current craze for dark heroines. It reveals which themes tend to sell best. And all with fascinating supporting data taken from a five year study of 20,000 novels. Then there is the hunt for â€œthe oneâ€â€”the paradigmatic example of bestselling writing according to a computerâ€™s analysis of thousands of points of data. The result is surprising, a bit ironic, and delightfully unorthodox. This book explains groundbreaking text mining research in accessible terms and offers a new perspective on the New York Times bestseller list. It is big-idea book about the relationship between creativity and technology that will be provocative to anyone interested in how analytics have already transformed the worlds of finance, medicine and sports. But at heart it is a celebration of books for readers and writersâ€”a compelling investigation into how successful writing works, and a fresh take on our intellectual and emotional response to stories.